TERUYUKI OKAZAKI: U.S.A. Seminar. Report By Farid B. Amin M.D. Reducing the risk of injury. By John Holdsworth. Small steps forward.By Mike Clarke. Thoughts from Japan: 'A QUESTION OF CONTROL'. By Dave Hooper. The debate continues. By Guillermo A. Laich. M.D., Ph.D. There are some alternatives! By John Cheetham. ENOEDA & OSAKA: Paris Course. Report By A. G. Sanna. 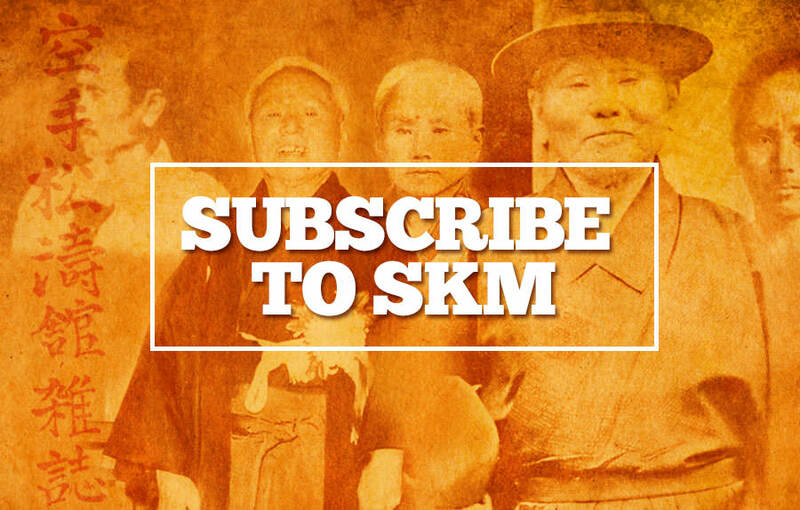 We are highly honoured to feature one of the world's most senior Shotokan masters in this issue, a direct disciple of Master Gichin Funakoshi and still very active as you can see even at the tender age of seventy years. 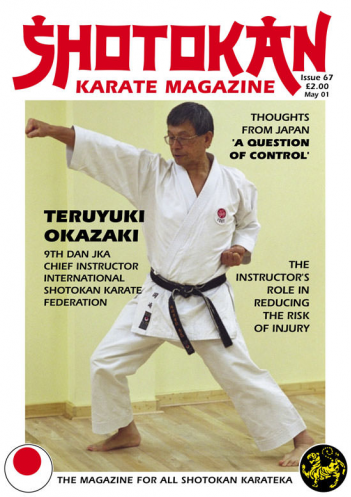 Teruyuki Okazaki 9th Dan leads the huge ISKF organisation with strong links to the Japan Karate Association (JKA). Okazaki sensei's seminar report by Farid Amin is not only technical but has many fine insights into this famous character from Shotokan karate. Many instructors are now urging us all to make the effort and recite the dojo kun at the end of every session along with mokuso and the formal bow: The Dojo Kun; the code of ethics of Shotokan Karate-do. This ties in with a point raised in the last issue in a letter from Eli Lemos (United States). Basically this letter stated how important the dojo kun is, but how useless it is, if it is recited at the end of each class in JAPANESE, if you don't happen to speak Japanese or understand what the code means? Although there's another good point in a letter in this issue, arguing for both interpretations? I'm positive that if Gichin Funakoshi were alive he would insist on this important issue. We (traditional karateka) are practicing a 'do' form and we should not just practice karate at the 'physical level' only, but also incorporate the philosophy; this is Karate-Do ˙ 'The Way' of Karate, which differs from karate-jutsu! It looks as if most of us were right all along regarding the back foot/heel debate. This is the conclusion I personally draw from the biomechanical breakdown by Dr Bill Laich. Last issue he pointed out that the back heel flat appears to be (biomechanically) effective for 'defensive' actions and for kihon and kata practice but in the debate this time the focus is on the 'attacking' ˙ lunging forward scenario, where it appears that you have to drive off, and be up on, the ball of the back foot! For me the old saying, "A picture paints a thousand words," answers the question! You only have to analyse the two photo's of the great Shotokan technician, Hirokazu Kanazawa in this issue; one breaking wood (on page 30) in an 'attacking' posture and (on page 18) 'defending' (blocking and countering), to see this debatable point very clearly. So, we can all sleep at night now; defensive posture and attacking posture 'appear' to be different when applying karate? You may think that my own article in this issue is a bit 'heretical' or anti-traditional but I'm hardly likely to be 'playing down' Shotokan! No, 'basically' I'm just pointing out that maybe there are some alternatives to traditional methods, as many people feel, for instance, that makiwara training is in fact dated and possibly (?) no longer necessary. Maybe there are better alternatives? Anyway, the article was written in the spirit of progress and no disrespect is meant. I feel very strongly that we shouldn't tamper with, change or alter the basic techniques, kata, and principles of traditional karate; this is the 'art' of karate. However, technique improvement and training methods must progress in the best interests of injury free training.